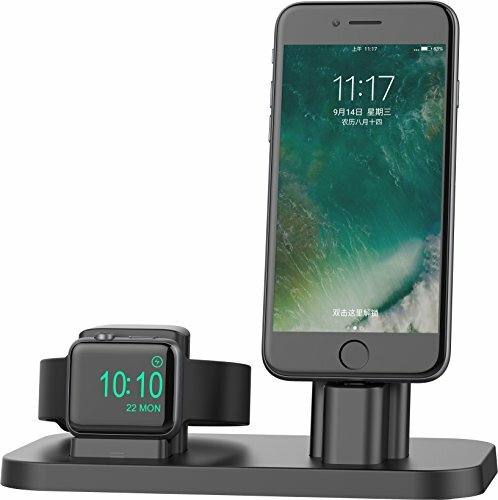 Compatible with all versions of the Apple Watch SERIES 2 and Apple Watch SERIES 1 (38mm & 42mm) and iPhone 7/ iphone 7 plus/SE/ 5/5S/5C/6/plus/6s/6s plus/ iPad MINI; Apple Watch stand-Innovative Lift Platform Design make the stand easily compatible with almost every AppleWatch (whether naked or wearing case) on today market; holds your Apple Watch steadily with elegance, durability and fashion, also supports nightstand mode; iPhone Stand - Showcases your device for sturdy, hands-free interaction like Face Time or Skype , support your iphone with different thickness case(fit for 99% case in market) .such as spigen.Speck Candyshell.Griffin Reveal.otterbox lifeproof..works exclusively with your Apple Lightning Cable (not included) and conveniently turns it into a charging dock for your desktop or nightstand. also supports iPad MINI; Compatible with Apple original Lightning cable, and new AmazonBasics Lightning cable(3 Feet & 6 Feet)which have same size lightning plug as the original one. (cannot be guaranteed to be 100% applicable for all the AmazonBasics Lightning cables, if your cable doesn't fit the slot well, please replace to Apple's original one) PLEASE NOTE: THE IPHONE, APPLE WATCH AND THE APPLE lIGHTNING CABLE, APPLE MAGNETIC CHARGER SHOWN IN IMAGES ARE FOR USAGE DEMONSTRATION PURPOSES ONLY, AND ARE NOT INCLUDED WITH THIS PRODUCT..